Weird thing for a social marketing measurement company to post, huh? It’s not even click bait — it’s true. 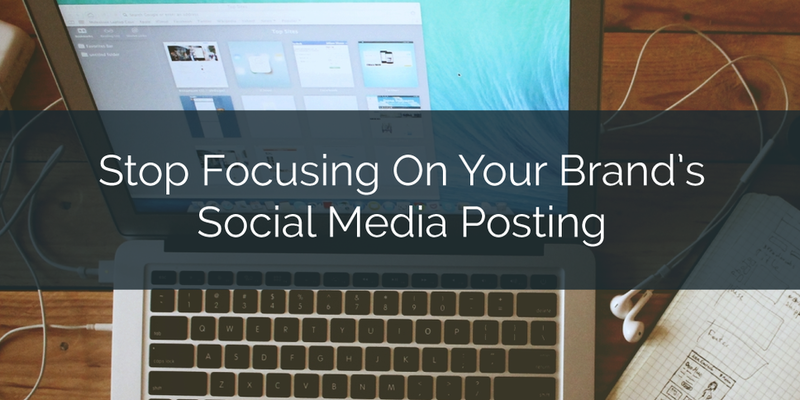 I’ll even say it again: stop focusing on your brand’s social media posting. Owned social (what your brand posts) as a powerful business driver is a thing of the past. If anything has been made clear over the last few years, it’s that organic reach on social isn’t guaranteed. Only the biggest publishers are seeing significant organic reach, and it’s because they have deals with Facebook. Clamoring about the best ways to marginally increase your organic reach is shortsighted. The social networks can change their algorithms or cut it off completely at their discretion. Facebook just announced another news feed reprioritization to show more “real friend” content over brand content. When you play on someone else’s platform, you don’t get the luxury of control. Mobile optimization is a no-brainer, especially for B2C brands. Facebook recently announced that nearly ¾ of their ad revenue is from mobile, yet Google’s recent “Mobilegeddon” announcement surfaced the fact that 44% of Fortune 500 websites aren’t mobile-friendly. Make sure you are giving your audience a great mobile experience. What social networks are offering and have to continue to do for their own livelihood, is effective advertising. With new ad products introduced all the time, and up-and-coming social networks debuting advertising opportunities, paid social is and will continue to be in the forefront. Additionally, social offers the most precise ad targeting, allowing marketers to capitalize on the most personalized insights. Facebook’s custom audience targeting, for example, allows brands to integrate first-party insights with earned social insights from social platforms [link to blog post] to deliver ultra-targeted messages. Social platforms, including Facebook, Twitter, and LinkedIn, are extending to other ad types as well, allowing brands to use their social platform data to reach consumers off of the social platform. Social is eating more and more of the internet — even more reason to focus on social targeting. Between retargeting strategies as well as other behavior-based targeting and interest-based targeting, broad demographic targeting should be a thing of the past. Focus on developing new strategies to get the right content in front of the right people. Your ROI will soar. Like all marketing, the best social marketing has roots in deep consumer insights. The ability to identify novel consumer insights is where social is different from other advertising channels. When it comes to TV advertising, it would be ideal to know when each individual watches TV, what channels they watched, which of your ads they respond to best, and what a TV ad for your brand would look like if they made it…and then play that ad for them exclusively, all at a low cost. Without a doubt, that would be effective advertising. Maybe the most effective ever. Well that’s precisely what social ads can look like when brands leverage their earned social insights. Through effective earned social tracking and measurement, brands can see when their audience is active on social, what social networks they are active on, what social content they engage with, and what their posts look like when they share brand content (e.g. a link from the brand’s website). As a direct response to Facebook’s news feed algorithm that’s forever changing in favor of friend posts over brand posts, social marketers need to be focusing on getting their fans to share their content. That way it’s a friend post, and will be shown more frequently and higher in the news feed. Not only that, but consumers find their friends’ recommendations far more trustworthy than brand messages. More than just increasing reach, it influences consumer behavior. Here are five ways to create more shareable content. The major social networks are saturated with content. It’s why Facebook has to keep updating the news feed algorithm to surface the content that their users actually care about. A Forrester report, Social Relationship Strategies That Work (gated), found that fewer than 0.1% of a brand’s following interacts with the brand’s post. It does show, however, that newer platforms are a promising alternative…at least for now. Instagram, for example, has over a 4% follower interaction rate. Brands that can understand these platforms now will have a big advantage in the future, as they will better understand core consumer behaviors on these platforms and will be able to more naturally deliver positive brand experiences. Here’s an article to help you evaluate what emerging social platforms are right for you. We talk about this a lot on this blog. Engagement is just a stop on the path to conversion — don’t stop there. The true measure of social marketing success is the ability to drive business conversions — whether that’s leads, content downloads, email subscriptions, or even purchases. Facebook has taken a big step forward in conversion measurement because they know that’s where the true value is. By focusing on conversion measurement throughout all of your social efforts, you’ll be able to prove your true impact on the business. Too often, brands don’t actually treat social media like a two-way street. Here’s a good little rant about it by one blogger. Yes, we, too, are guilty of this sometimes. But treating social like a two-way street doesn’t necessarily mean going out and initiating a bunch of conversations with people who probably don’t want to engage with you in the first place. Sometimes, it means that brands just need to listen first — to spend time taking in the thoughts of their audience, learning their language, and observing the experiences they go through. Do this with the goal of greater empathy. Your audience and the content you produce will benefit greatly.